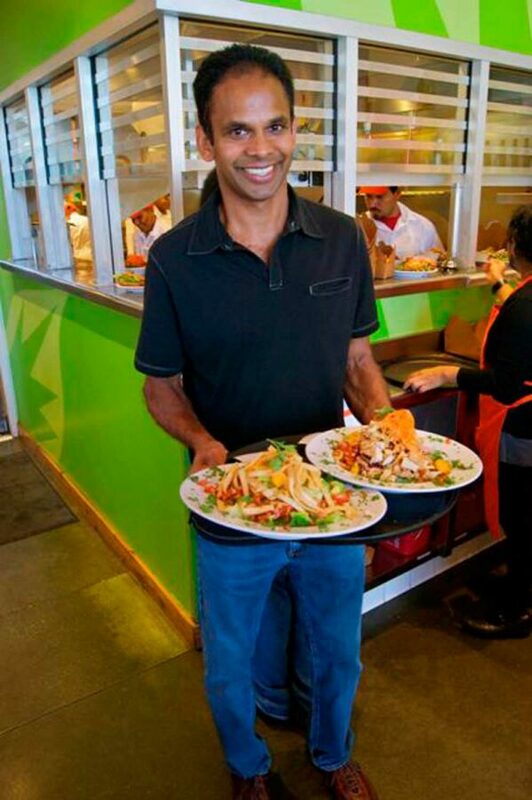 Veggie Grill co-founder T.K. Pillan at his restaurant in Rolling Hills Plaza. Photo by Ciley Carrington. The Beach Cities have become a hotbed for business creativity and execution, especially in the food industry. Over the past few years, we have seen an increasing number of new and exciting concepts begin here before expanding to multiple locations in other states. However, very few of these concepts truly break new ground or innovate the way Veggie Grill has with its 28 locations. I spoke with co-founder T.K. Pillan to discuss the genesis of the brand, the role the Beach Cities has had in their success, and on expanding nationwide with their Chicago and Boston units opening up soon. A menu based on vegetables and plant-based food may have sounded risky when the first Veggie Grill opened in Irvine 11 years ago. In 2008, Vegetarian Times published a study suggesting that just 3.2 percent of Americans or 7.3 million people considered themselves to be vegetarians. These numbers were not particularly compelling, but Pillan and his partners were ahead of a related trend. According to a recent study, over 40 percent of people surveyed are trying to eat healthier and reduce meat and other animal-based food consumption. This is particularly true in “progressive metropolitan areas,” which became the target for Veggie Grill’s expansion in the near term. While they may have started with the intention to expand nationally over time, Pillan recognized that the “first one had to work.” They had a lot of kinks to work out. Along the way, Pillan, an 18 year resident of Manhattan Beach, discovered that the beach cities are home to “many successful business people” with a penchant for sharing ideas. There is no doubt “this was definitely helpful,” not just with idea-sharing, but also testing early versions of the menu and brand, and even bringing on board members. He has made great connections in unexpected ways, including going downtown for coffee, talking to other parents of children in the local schools, and even walking his dogs through the neighborhood. He also lives within a few blocks and has developed friendships with industry leaders like Chris Simms of Lazy Dog Café, Adam Goldberg of Fresh Brothers and Michael Zislis of Shade Hotel and Rock & Brews. Each of them has established successful brands with multiple units across several cities and have been open to sharing their perspectives. In 2015, Pillan formed an investment fund, Powerplant Ventures, to support “visionary food companies leveraging the power of plants.” They recognized that there is an increasing number of pioneering companies developing innovative proteins. In fact, revenues for the plant-based food industry topped $4.9 billion last year and continue to grow. The community again was a valuable source of contacts in the fund management and investment world. And of course, one company they have invested in was Beyond Meat, co-founded by Manhattan Beach resident Brent Taylor. Business leaders in the beach cities are increasingly proving to be an important resource for local entrepreneurs hoping to create dynamic new companies or to expand on early successes.